The plot starts off basic enough but then weighs itself down with complications to the point where we start losing interest and stop caring. 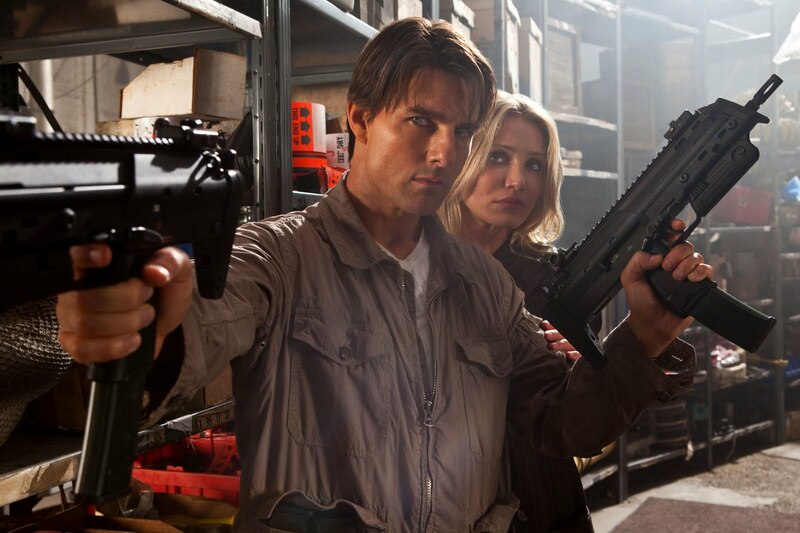 Knight And Day is one of those movies that gets worse and worse the longer it goes on. It looked promising and like a film with real potential for all sorts of reasons, and it fails because not one of those reasons turns out to have any merit. the most attractive thing about the movie is its director, james mangold, who i’m sad to say has made his worst movie to date with this junk. Mangold’s best movie was his breakout film, copland, over a decade ago. but he followed it with other good movies too. girl, interrupted and identity and walk the line. i wasn’t crazy about 3:10 to yuma, but it was a film that did have some quite a bit going for it. that’s more than i can say about knight and day. the movie wants to be one of those genre bending spy thirller-comedies. we’ve already seen that with mr. and mrs. smith and that movie managed to pull it off. it worked mainly because it kept it’s plot simple. a married couple, both are spies, both find out each other’s secret and target each other, and both end up on the same side as the target of a much bigger organization. the bad guy in that movie didn’t really have a face, for example, and that helped keep things basic and to the point. 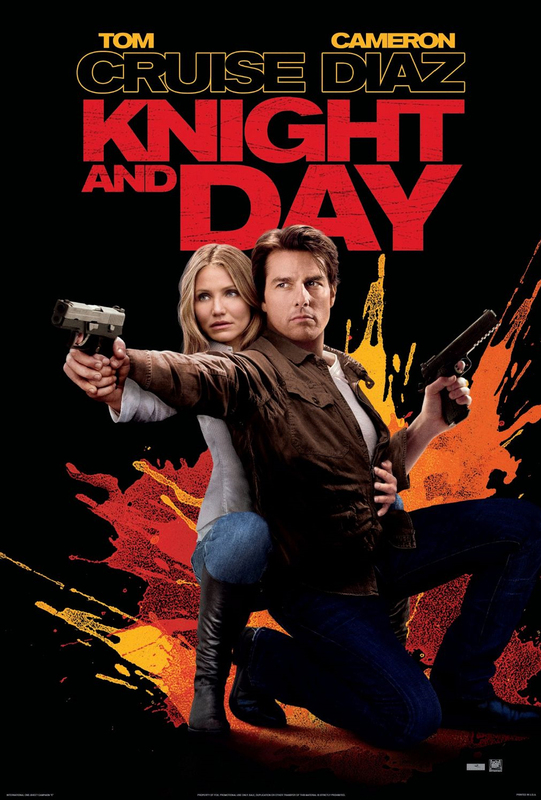 unfortunately knight and day does not take a page from the same book. another thing that looked great about the movie was the trailer featuring the muse song, uprising. it was a pretty perfect trailer with all the best scenes in the movie thrown in there. it had the scene where cameron diaz’s character. june, explains to a friend of her’s at a coffee shop about cruise and the experience she had with him. and then cruise shows up and takes her off. it also had a scene where cruise is riding behind june’s car on a motorcycle and goes flying on the motorcycle into the air. we stay in the car and from that point-of-view, see the motorcycle come out of the air and land in the water. then the helmet lands on the hood of the car. and finally, cruise comes landing on the hood as well. it’s a pretty brilliant moment, but a moment only lasts for so long. The humor is very hit and miss in this movie, and at no point is it ever really great. i suppose the funniest stuff is when june comes out of the bathroom on the plane and cruise’s character, roy explains what happened and she doesn’t believe him. she starts laughing and he laughs along with her and it’s kinda funny. he has such a laid back reaction, saying things like, “it was just one of those things.” but after that, the comedy kind of fades. that’s another problem here. the movie spends too much attention on it’s plot and that becomes a very bad thing once it’s plot becomes more complicated then we are willing to follow. the movie starts at the airport in witcHita, kansas, where our two leads bump into each other. twice. then they get on the plane together and start talking about romantic getaways. it is a very boring conversation, especially when there hasn’t been a single bit of action yet. and then june goes to the bathroom and the action begins. why were these guys waiting for her to go to the bathroom before trying to kill roy? It would have been much funnier if he killed each of the five or so passengers one by one while june was just sitting there in her seat, not noticing anything. But that doesn’t happen. when june gets out of the bathroom, roy explains things and then takes over flying the plane. he lands it in a corn field and we get a very cgi-heavy scene. I suppose that’s the way movies go with scenes like this these days, but they used to do it for real and i miss those days. passenger 57, for example, didn’t use any computer graphics to manipulate and crash it’s plane. and i would have thought better of james mangold. he certainly didn’t use any cg in his best movie, copland. i’m sad to say that if he made that movie today, he probably would have. he probably would have used cg to show peter berg falling off the building for example, from berg’s point of view as he fell. and that would have ruined the whole thing, the whole surprise of getting that door opened to the roof and getting to the edge and seeing berg’s body down on the ground. CGI doesn’t make things better. it makes them less personal. yes, it might be showing more, but what it’s showing is so fake looking that it takes you out of the moment. when roy and june ride a motorcycle through the streets of spain at the end and outrun a pack of bulls, it isn’t half as interesting as it should have been. i hear that some of the bulls were real, but they just look so fake as does everything they run through. it could have been a great stunt, but bringing the computer effects in ruins everything. the big problem with the movie is the plot. it intentionally gives a wavering storyline to the point where we don’t know if roy is good or bad. but that isn’t half as much fun as the movie thinks it will be. having the main character be a bad guy is a really big deal. it changes absolutely everything. but this movie treats it as if it’s no big thing, going back and forth on the topic a number of times. if you’re gonna do it, do it once and leave it for the end, like (spoiler alert…) the kevin costner movie no way out, or primal fear, or the usual suspects. another problem with the movie is that it just goes on and on. and it makes you think it’s coming to an end and then just keeps going for a whole lot longer. that can be a good thing or a bad thing, depending on how the audience feels about the movie. if the movie is great and the audience wants it to keep going, then yeah, extending it longer could work. even then, however, the smart thing to do would probably be to end and leave the audience craving more. but when the movie is not working and the audience is ready for the movie to be over and the movie makes it seem like it’s going to be over and then just keeps on going, it’s a disaster. that’s what happened in steven spielberg’s a.i. and that’s what happens here. the movie takes a major spin downhill once the paul dano character, simon, is introduced. he’s a weakling who roy has to protect, as if he’s not busy enough doing that for june. and dano offers nothing to the movie, which is a real shame considering how great he was in both little miss sunshine and then there will be blood. i guess he couldn’t find another great project so easily to follow those two up with. that’s a real shame. peter saarsgard and viola davis are in the movie too, and they are both good actors, but an actor is really only as good as the material. viola davis, for example, was so great in doubt because the part was so well written. she only delivered on what she was given. and here, these actors aren’t given much. the way the bad guy is terminated is reminiscent of the way willem dafoe’s villain died at the end of speed 2, by flying a helicopter into a pole. it was one of the worst villain killing endings of all time and this movie nearly rivals it. it’s a dumb movie all around. the plot complications are the worst part because they make us lose interest. some of the action is okay and the initial premise is still likable, but boy does this movie go downhill once the wheels start coming off.